Laser Cutting Inc., a Milwaukee-based manufacturer, founded and owned by bulgarian George Mladenov, designer and wide-format printer that specializes in point-of-purchase displays, laser cutting and engraving and custom fabrication, will have one of its most unique products on display this week during the inauguration of President Barack Obama. The company recently created and shipped a 7-foot, 4-inch diameter version of the Seal of the President of the United States to be installed in a conference room in the Capital Hilton in Washington, D.C. The seal will be on permanent display it the conference room, McMillan said. The hotel had a previous version of the seal that they wanted to be replaced he said, and his company was contacted because of its unique fabrication capabilities and reputation. Laser Cutting’s wide format printers can also print indoor and outdoor-quality signs, which are often laminated onto non-metallic materials. 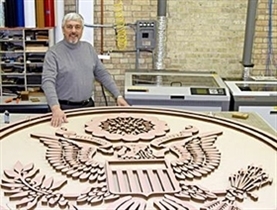 The company then uses its 13 different laser cutting beds to create uniquely shaped signs. Laser Cutting has fewer than 10 employees in its facility at 1549 S. 38th St. on Milwaukee’s south side. The company relies heavily on automation, so it is able to produce large quantities of pieces with a relatively small staff. “We’ve done parts for Ford Mustangs – we can do large-run production or one or two type stuff like the seal for the Capital Hilton,” McMillan said. Laser Cutting has seen increased orders in recent weeks, largely because of its efforts to diversify its client base. “We’re doing a lot of components for the medical instrument industry,” McMillan said. “We have very tight tolerances – we are making stuff for military applications, and we’ve also made parts of components that go into new Boeing planes.